Port Moresby’s electricity generation capacity is set to almost double, with the advent of two new independent power producers, Dirio Gas & Power and NiuPower. For the first time, gas will be used for domestic power supply in Papua New Guinea—but challenges remain. 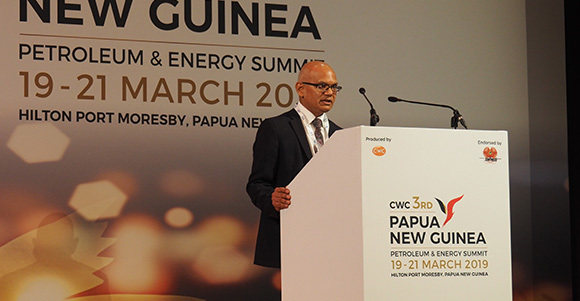 Dirio Gas & Power is the first fully nationally-owned Independent Power Producer (IPP) in PNG, explained its CEO, Ashok Jain, during the 3rd CWC Petroleum & Energy Summit in Port Moresby earlier this month. Dirio is owned by the state-owned Mineral Resources Development Company (MRDC), which manages landowner equity interests in PNG’s mining and petroleum projects. Jain said the target date for completion of Dirio’s Port Moresby 45MW power project is June or July this year. The project will supply gas-generated electricity to state power utility, PNG Power. ‘The MRDC is raising it like a first-born child. It builds belief and establishes our credentials,’ he said. The power plant, located close to the PNG LNG plant, will use three 15 MW turbines. Jain said a short gas supply pipeline connecting Dirio’s power plant to the PNG LNG Plant will be completed by ExxonMobil. He said the gas needed by the plant is less than one per cent of the total volumes of the PNG LNG project. ‘The Port Moresby power market is a very developed and growing market. The network is far more developed than the rest of the country,’ he observed. Jain added that the relationship with Dirio’s customer, PNG Power, is the key to the success of the business. Jain said that supporting initiatives such as Dirio is crucial to reducing PNG landowners’ dependency on royalties from the big resources projects—what he dubbed the ‘dependency syndrome’. MRDC is also the main investor behind the recently completed Hilton Hotel and Kutubu Convention Centre in Port Moresby. Richard Robinson, Chief Executive of NiuPower—a second IPP jointly owned by Kumul Petroleum and Oil Search—said its 58 MW Port Moresby power station was set to start operating in ‘the third week of April’. ‘It has demonstrated that private sector involvement in gas-fired generation can provide a very cost-efficient solution,’ he said. Niupower’s plant will be using six ‘high efficiency generator sets’. Robinson said it would have been cheaper to buy turbines, but there would have been a substantial downside. ‘Our engines have an efficiency of 44 per cent; the efficiency of turbines in this size range is low-to-mid 30 per cent: the net effect is US$5 million a year. ‘We can produce a much lower cost of electricity than we would have been able to achieve with turbines. ‘In addition, with the six reciprocating engines in configuration, it means we can efficiently deliver anything from 6 MW to 58 MW. For all parties to benefit from the advent of gas-generated power, the price has to be right—for the gas producer, for IPPs, and for PNG Power. ‘We must get it right: the volumes, the price, the timing,’ said Jain. He warned that the Domestic Market Obligation (DMO) price for gas—the price at which local IPPs can buy it, which has been estimated at ‘about 75 per cent of export price’—is too high. ‘If we are serious about developing a gas-based industry in PNG that our Prime Minister has talked about—not just power but all gas-based industries—then this price needs to come down. Robinson said many challenges also remain to get electricity across PNG. ‘The reality is that large centralised power stations only make sense if there is a large load in that region.